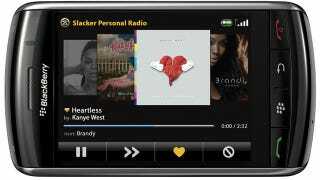 Does the World Need a BlackBerry Music-Streaming Service? Look, we get it RIM—your BBM service is great. But a music-streaming service that runs in BBM? WTF? Cnet heard from sources that they've signed papers with one of the four big music labels already. According to Cnet's men, RIM's about ready to sign up another two music labels, a feat which took Spotify years to accomplish in the US. How exactly it would be integrated within BBM remains a mystery—would chatters be able to share and recommend songs? List their current-played track in their status? If BBM does make it to other platforms as rumored, would the music service go with it? Rumor: BlackBerry Messenger App Being Built for Android and iOS?